In a whirlwind of driving, lifting, and spending—I've made it to Tug Hill. I bought myself a house with 18 acres of land behind it. I moved in and unpacked. I assembled a bed frame, a standing mirror, a desk, and hung a TV on the wall. 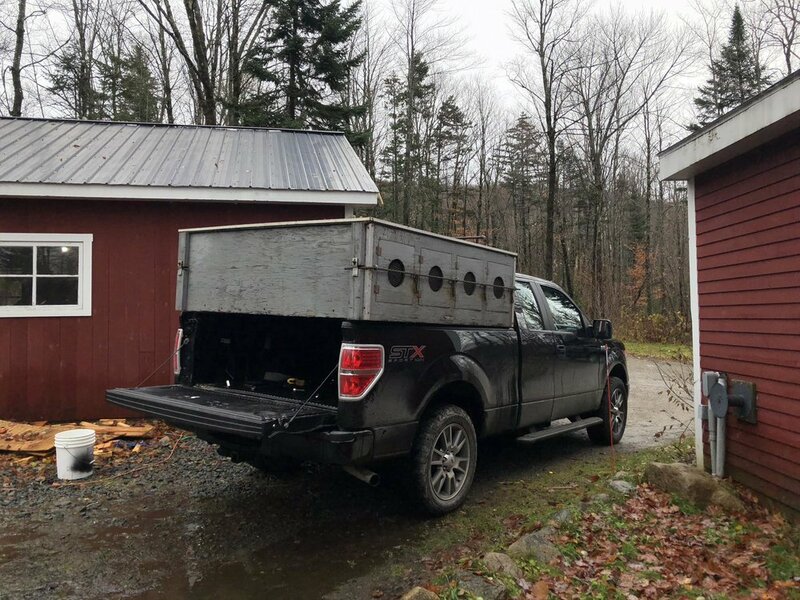 I bought a pick-up truck and drove to New Hampshire for the dog box I had paid for weeks ago. I’ve lit fires in my wood stove to stay warm. I applied for my New York state license and registered all my vehicles here. I lifted a lot of heavy boxes. I cut my finger slicing an avocado (my first time cooking in months, of course). I put long-term radon test kits in the basement and dog den. I pulled up the ugly pink carpet from the living room and dining room. I put a thousand dollars worth of vinyl flooring on my credit card (it will get paid off after my next paycheck; I’m accumulating points). I’ve done a lot, but this wasn’t a solo effort. I could afford this house because I’ve spent the last decade living with my family or with Will, where rent was very reasonable or nonexistent. My parents drove me back here from California. My mom and sister have watched the rest of the pack while I’m up here with Hubble. My dad loaded my trailer for me. Will helped move stuff up here and bought me a snowblower as a housewarming gift. It takes a village to be a dog musher. Everything has been coming along, but the move has not been without hiccups. The dog yard fence still isn’t up. I haven’t found a plow truck yet. Snow is coming, ready or not. This weekend, I was outside moving gear around, so I put Hubble on a long tie out in the yard with me. He could see me, but he wasn’t glued to my side—which is where he prefers to be these days. He voiced his discontent by flailing around and barking. At one point, he walked up the porch and decided to jump off it. Luckily, the line was long enough and the porch short enough that he didn’t hang himself. I ran over, unhooked him, and put him inside a crate in the van while I finished my outdoor chores. Then I had the added chore of prying out the now-stuck tie out line from where he wedged it in the porch bannister. Before I could go into a full-blown anxiety attack, I managed to pry the line out. I finished moving my gear around. I pulled the cargo box off the top of the dog van and measured to see how tall it was. I kept on working. Onto the next thing. Even though I have a big pole barn and attached garage, not every opening is big enough for my tall van or my wide truck. The back bay of the barn houses the ride-on mower. The middle section and workshop is short and would only feasibly fit a regular sized car (or all my mushing equipment!) The front section is taller and can fit my dog truck with the dog box. My plan was to use the other bay for a plow truck, but I was worried I’d have to store my van there. Thankfully, without the cargo box, the dog van fits perfectly into the attached garage. This all might sound fairly trivial and like a bunch of First World problems, but the snow up here is no joke. I need to have my vehicles inside and out of the way so I can safely plow the driveway out. So, despite the ups and downs, things are moving in a generally positive direction. I’ll be happier once I have all the dogs here with me and we start running again. The whole reason I’m here is to mush and it won’t feel like home until I’m on the trails with my buddies.